Out the FA Cup again without a whimper against a lower league team. Fine, if Villa were pushing for Europe, but now there’s really nothing left for the club to play for this season. Don’t the players have any pride anymore? What exactly are Lambert’s tactics? If the team want to avoid getting booed off the pitch, may I suggest putting more effort in on the pitch. 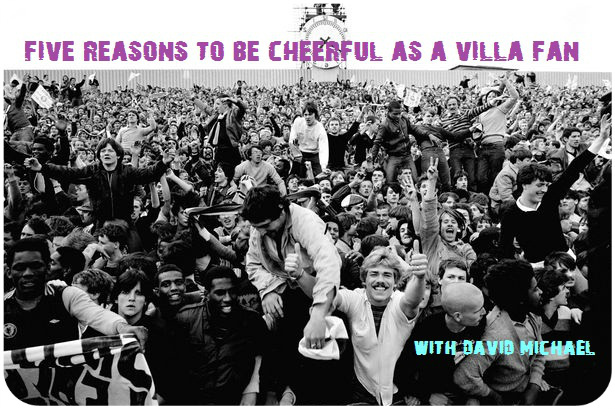 It’s a sorry state of affairs, so what are the five reasons to be cheerful for Villa fans? 1. The FA Cup doesn’t matter much according to Lambert, so it’s no big deal getting beat by a Division One at home. Right? It’s at least better than being knocked out of a cup by a Division Two team, like last season. Progress? 2. There was no injuries during the game. Unfortunately though, Nathan Baker got injured in the warm-up. At the moment, this sums Villa up. 3. At least Helenius proved a point by bagging his first proper Villa goal, which is a good sign in view of the Kozák injury. His goal scoring record before Villa was decent and he scored a couple in preseason for Villa too, so why does Jordan ‘No Goals’ Bowery get the nod over him normally? 4. Of the 24,038 at Villa Park for the FA Cup game, 6,000 odd were Sheffield United fans, meaning only 18,000 or so Villa fans witnessed what some have called the worst performance by Villa in recent times at Villa Park. 5. The 2013/14 season is already over now (unless Lambert takes us into a relegation battle). You can now look forward to the World Cup in Brazil and a better FA Cup run in the 2014-15 season. Yes 7 reasons oh look it spells LAMBERT? What do you mean “(unless Lambert takes us into another relegation battle)”? We are already in one! Yes, Steveavfc! Spot on. Lambert has had money so we can’t blame everything on Lerner. PL has brought in some 15 players at about 50 million. That’s a team plus subs! And our best players, Benteke apart, are those who were there before he arrived. I’m pleased the Club have a project. I wonder what the aims and objectives are to enable to achieve this “project”? I think you can look forward to ever smaller crowds at VP, who wants to pay good money to watch Lamberts headless Chicken tactics & embarrassment at being beaten by lower league teams every year, long term plan!! do. Me a favour & every other Villa fan, just admit we are crap & you don’t have the answers!!! The beauty of the FA cup brings home how important it is to all football supporters when a top division club is knocked out by a so called small club from a lower league , every supporter up and down the land breaths the excitement that come with this grand old cup competition and for those like us yesterday it a good reason to vent our anger at the club management and team . I believe I’m a realist and know that no team has the right to win a game of football no matter who they are ,heart,desire ,skill ,passion ,and team ethic go along way to bringing success in any game but it’s not always garanteed to get the right result but it will go along way to helping bring that success ,I believe luck plays it’s part to but that’s one eliment you cannot rely on . Herein lies our problem a manager who’s interview was apparently taken out of context disrespecting the cup as a mere distraction and then to feild a near full strength team only to be knocked out without a whimper says more about our manager than the players we have at the club ,he sets the play he sets the formation ,he takes the training (or does he) he is meant to be the insperation behind the clubs ambitions the driving force behind the great plan . Actions mr lambert speak louder than words my advice to you is to keep your opinion on cup competitions to yourself your attitude works it way to the squad and sets the tone for those games . You need to take a long hard look at yourself .